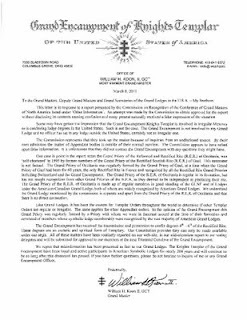 In the wake of the Conference of Grand Masters of Masons of North America's Commission on Recognition report in February concerning the formation of the Grand Priory of the Reformed and Rectified Rite of the United States of America (CBCS), M:.W:. 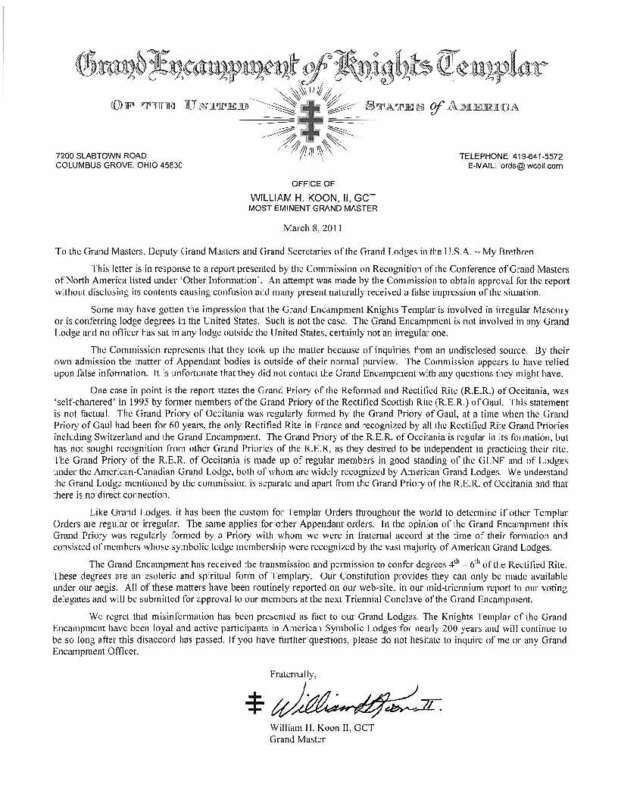 Godofredo Santy Lascano , Grand Master of Grand Lodge of Washington (State) F&AM has issued an edict. 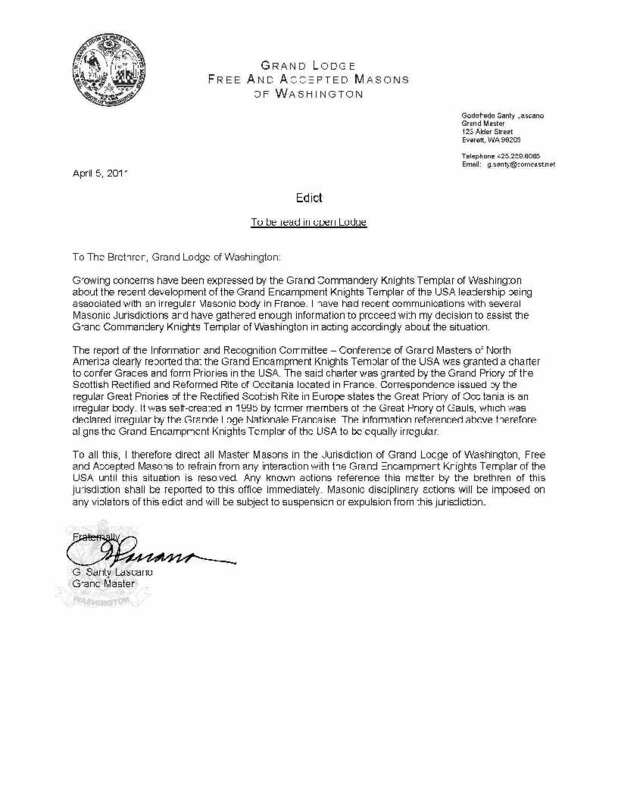 He has directed all Master Masons in Washington "to refrain from any interaction with the Grand Encampment Knights Templar of the USA." Violators will be subject to suspension or expulsion. 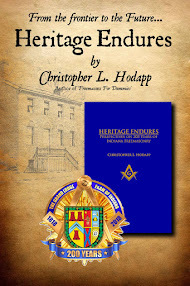 At issue is the question of irregularity of the French governing body that issued the charter to the GEKTUSA to form the new Grand Priory. 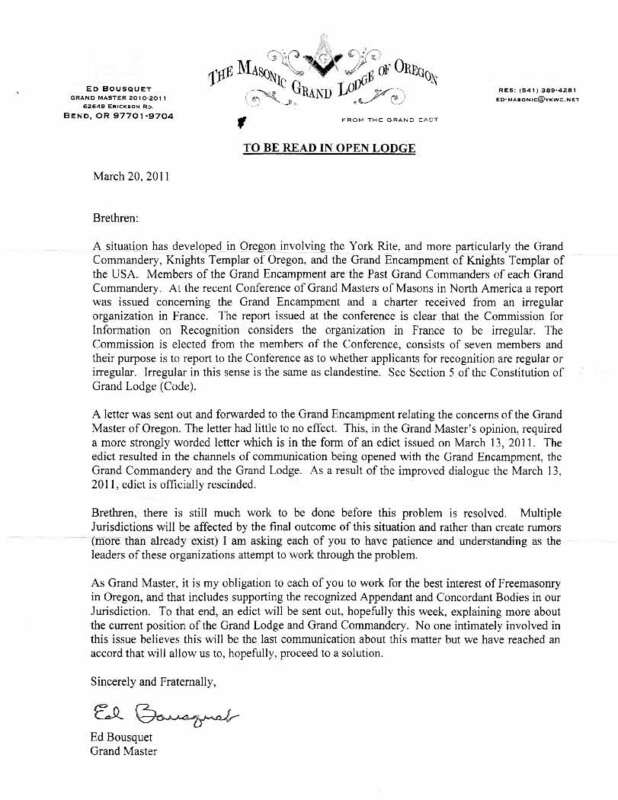 The Grand Lodge of Oregon AF&AM Grand Master Ed Bousquet issued a similar edict in March, briefly suspending recognition of the Grand Encampment of Knights Templar USA, but rescinded the edict a week later, in light of "improved dialogue." 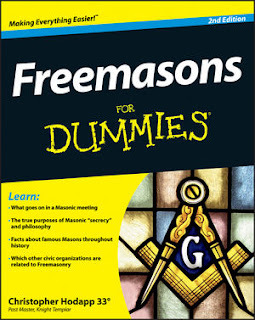 Grand Master Bousquet has asked for "patience and understanding as the leaders of these organizations attempt to work through the problem." 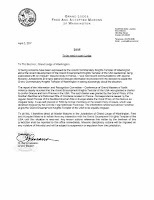 UPDATE: Below is a letter that was sent to all Grand Masters in the US in response to the Commission on Recognition report. 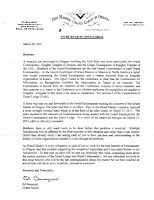 It should be pointed out that 4 of the 6 elected members of the Grand Encampment officer's line were present at the Conference of Grand Masters and none were asked, or even allowed, to address the Commission, or answer any questions on this matter. Click to enlarge. The Doctor Sez: "Fezzes Are Cool"